Vastint Latvia is honoured by this high acclaim from industry professionals, who showed their appreciation of the excellent quality, innovative solutions and immaculate finishing that characterise the first buildings at Magdelēnas kvartāls. As this was an achievement of the whole team, Vastint Latvia wants to thank everyone who was involved in the building process — your dedication, thoroughness and attention to detail helped to ensure the first residential buildings of Magdelēnas kvartāls were completed to such a high level. During the first phase, two residential buildings were constructed, hosting a total of 116 apartments — including seven Live-Work apartments, in which a living space on the first floor is connected to a working space on the ground floor by a staircase. This concept is unique on the Latvian real estate market. The two completed buildings also have three commercial spaces of different sizes, a car park for 73 cars, six garages, and additional storage spaces for residents. For more comfortable living, a spacious, green, car-free courtyard of 2,000 m2 has been laid out between the buildings. 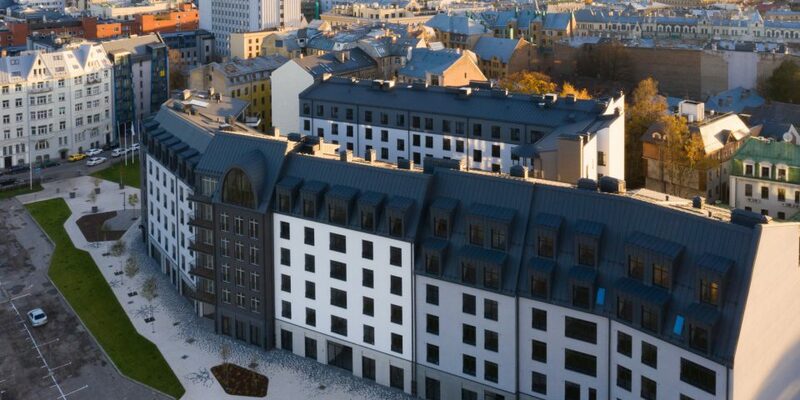 The project was developed by Didrihsons arhitekti SIA architectural firm. Merks SIA acted as the general contractor, and Alps SIA did the landscaping. When completed, the quarter will boast 300 apartments, 16,500 m2 of office space and 4,500 m2 of commercial space.